"One Toke Over The Line" became a Top 10 hit in 1971, and was largely responsible for introducing Brewer & Shipley to the masses. 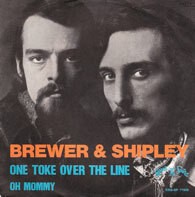 While the record buying public was casting its vote of approval by buying the single, the (soon to be disgraced) Vice President of the United States, Spiro Agnew, labeled Brewer & Shipley as subversives, and then strong-armed the FCC to ban "One Toke" from the airwaves just as it was peaking on the charts. Brewer & Shipley landed on Nixon's Enemies List, a badge of honor they wear proudly to this day. Even in the midst of all the fuss about the drug related lyrics, Lawrence Welk featured "One Toke Over The Line" on his show in 1971. Check out this bizzare story and the hysterical “One Toke” video from the Welk show. As Brewer & Shipley like to say, you couldn't make this stuff up.